Editor&apos;s note: This story has been republished from its original 2015 release. The audio version of this story contains an error regarding the difference in elevation between Cook County&apos;s highest and lowest points. The correct figure is approximately 380 feet. Picture it. The majesty of Chicago suburbia. The ridges of Park Ridge like waves of a tumultuous sea! The grandeur of Arlington Heights and the sweeping sublime of Palos Hills. And beyond, the bold peak of Mount Prospect rises in the distance like Olympus itself! Name-wise, the Chicago suburbs sound like the most romantic landscape this side of the Mississippi. In notoriously flat Chicago, why do so many suburb names imply elevation? A recent nationwide flatness study suggests Illinois is the second-flattest state in the country (number one being Florida, which will be under water pretty soon anyway), but you definitely don’t get that impression from the names of Chicago suburbs. And before you say: “But wait! There is some elevation out in the ‘burbs!” Let’s make something clear: You’re not wrong. 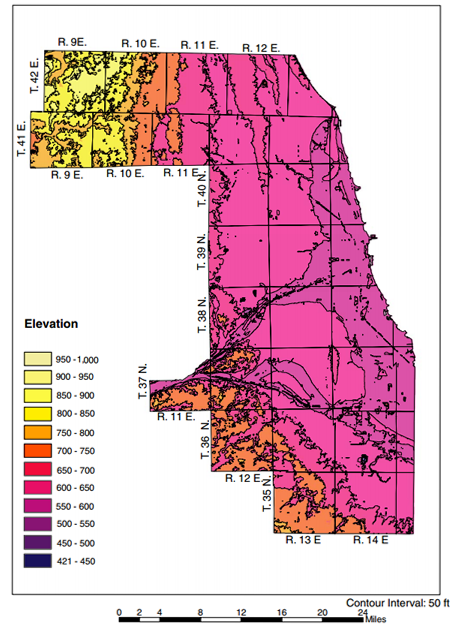 Chicago’s Loop is at about 570 feet above sea level, and the high point of Cook County is near Barrington Hills at 950 feet. That height difference is just under 400 feet, and that’s spread over 40 miles. If we were talking about any other state in the country (besides Florida) you’d barely notice the difference. In other words, in Illinois, the default standards are low for what’s considered high. Besides, getting muddled in the numbers takes some of the most interesting curiosities out of John’s question. Because the answer to why suburbs’ names involve height involves a melding of a broad cultural trend and a specific psyche present in Chicago-area real-estate marketing. I’ll move through three theories, each getting a little closer to sweet home Chicago. Whatever you’re picturing, it’s likely you’re confusing flatness for expanse, according to geographer Josh Campbell, who’s studied perceived flatness versus actual flatness. Flat is a feeling, he says, a perception that’s triggered by the absence of features that would otherwise disrupt the sense of expanse. For disruptors, think: mountains, bluffs, a dense forest of trees or even a visible coastline. Campbell believes he has convincing evidence for this cultural trend. When he surveyed people about what they thought the flattest state is, a common answer was Kansas. The correct answer? Florida. That’s because Florida has the visual relief of a coastline, he says. Even though Florida is the flattest state in the country, its coastline disrupts the human feeling of endless, repetitive, boring landscape. “Somehow relief in the terrain seems to be more exciting,” he says. And that creates a special challenge for the part of the country people feel is the flattest: the prairie states. 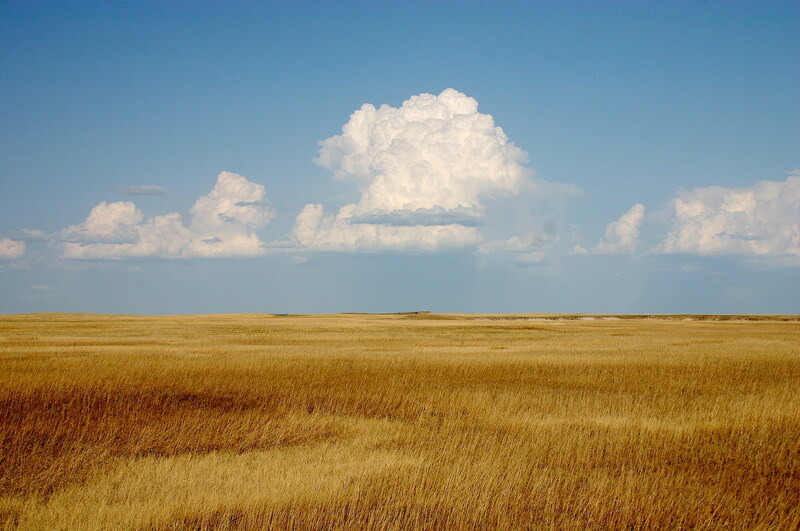 “Prairie landscapes don’t seem to hold the attention of people like white sand beaches and rocky mountains do,” he says. Campbell says if people feel prairie states are the most boring places on Earth, how do you convince people to move there, or travel there? Especially when it comes to Illinois, the Prairie State? He’s not too surprised to hear about all the height-inspired names of Chicago suburbs. 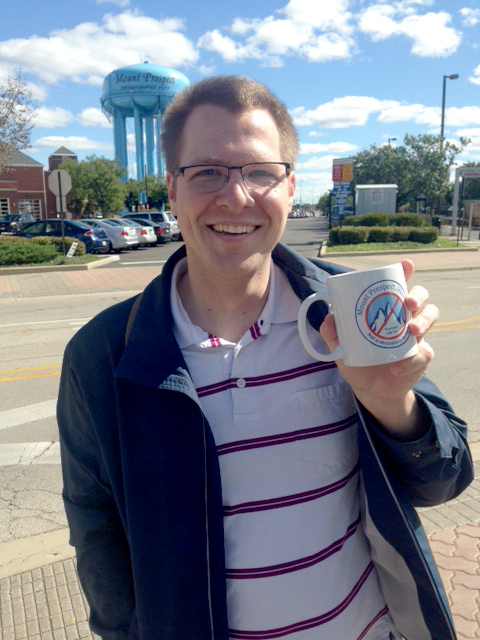 He says names like Arlington Heights and Mount Prospect make sense, in a way. And a “Mount” just sounds like a more exciting place to be than a field full of cows, no? Just look at this painting. Does this look like flat to you? No. In the mid-19th century, there’s a broad, cultural awakening of romantic, dramatic landscape, says Chicago historian Ann Durkin Keating. Flatlands, she says, just didn’t make the cut. For evidence, she points to countless paintings of settlers on horseback traversing mountain ranges, tourists gazing at waterfalls at sunset, or people standing before the bluffs of the Colorado River. Keating says artists, poets, and writers from the East Coast or from Europe had decided what “scenic” meant. Midwestern farmers didn’t play as much a part in defining the newfound cultural infatuation with scenery, much less creating art depicting it. And be honest: The last time you took a road trip, wasn’t Kansas the state you slept through? Bringing this back to Chicago suburb names, flatness just wasn’t fashionable in the 19th century media market. It was unlikely you’d want to look — much less live — in a place that evoked flatlandia. Keating says in 19th century, Chicago’s city center was ridden with filth and contagious diseases like Cholera and Typhoid. Those diseases were often transmitted through contaminated water, and the more low-lying, still water there was around, the easier these diseases could spread. In the 1870s, the northwest railroad’s commuter line gained popularity and provided an easy, accessible route to the slightly more elevated suburbs. Many wealthy Chicagoans moved out of the city and into the highlands. Simply put: Higher places meant healthier places, and they were marketed as such. If you put these trends together, it makes sense that if a Chicago-area town could be anything other than flat, it would aspire to be that other thing. And when it came to marketing and selling land in the early Chicago suburbs, many residents and realtors took that to heart. Chicago suburbs end up with names that imply elevation in these two ways: crowd-sourced rebranding and straight-up marketing. When William Dunton died in the 1870s, residents saw an opportunity to rebrand. After a bit of soul searching, they came up with (drumroll, please!) Arlington Heights. Why the Arlington? Keating says no one knows for sure. But the Heights? It wasn’t just inspired by the tiny bit of elevation. According to Keating, the name switch allowed the community to change its image — and its reputation — from a place people associated with farmland to a place people associated with trade and commerce. But what about so many other Chicago villages and towns, the ones that had elevation built into the name from the start? For that, consider the case of Mount Prospect, which, unlike Arlington Heights, got an elevated name the first time around, before it was incorporated. According to Jean Murphy, vice president of the Mount Prospect Historical Society, realtor Ezra Carpenter Eggleston bought a hunk of land along the railroad between Arlington Heights and Park Ridge in 1871. Hoping to make some money, Eggleston anticipated the place would prosper if he could convince the railroad to build a stop there. He named the place Mount Prospect. But, Eggleston’s own high prospects fell flat, and quickly; Eggleston failed to convince the railroad company to build a railroad station in Mount Prospect and the realtor went bankrupt from all the unsold lots. Basically, he abandoned ship (er, Mount). There’s little known about him after that. 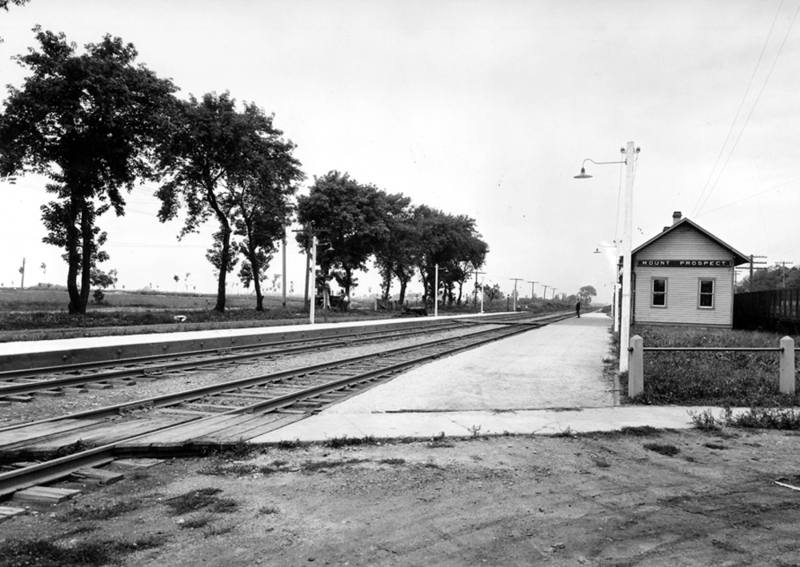 Mount Prospect eventually got its own railroad stop in 1886, but the place didn’t boom until after WWII. As for the name? Murphy suspects Eggleston was trying to “one-up” other towns with height-related names. 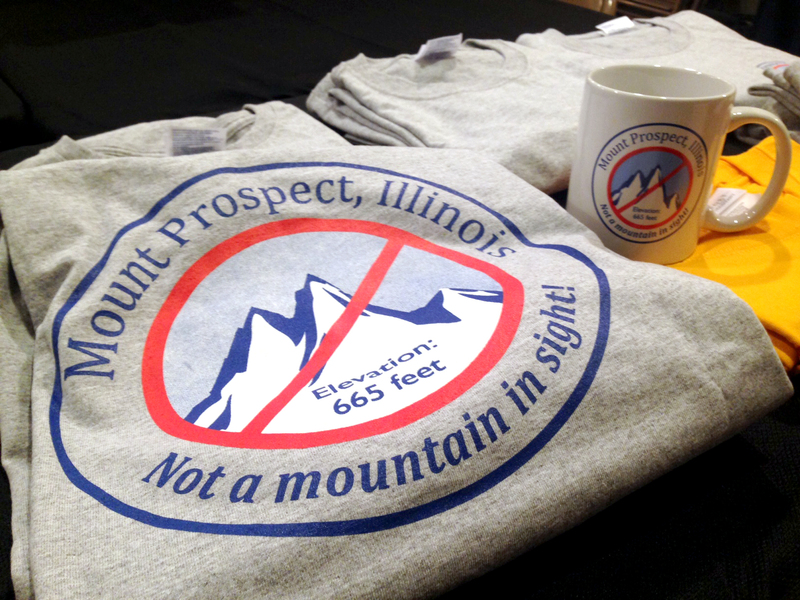 And Mount Prospect does sound higher than, say, Arlington Heights. Still, Murphy says Eggleston deserves some credit. And today, the Mount Prospect Historical Society is doing its own bit of Eggleston-inspired marketing. Funny, right? The Society’s self-aware shirt is a popular high school graduation gift. By the 1930s, it was possible to live in a Chicago suburb named after another Chicago suburb — or, actually, two suburbs. Example: Prospect Heights, its name being the offspring of nearby Mount Prospect and Arlington Heights. But we can’t end this story without taking the example of Ford Heights, just south of the city. Because if you think the whole suburb-name-marketing thing is something of a historic relic, it’s actually quite the opposite. Because in 1987, East Chicago Heights decided it needed to rebrand. The reason? Callary suspects the move was to publicly woo the Ford Motor Co. plant, which sat on an unincorporated piece of land outside of the village boundaries, into annexation. Speaking on the name change, a surprised Ford spokesperson said it was “flattering,” but that’s all. One-hundred years ago we named places very differently, Callary says. Places were named after a town founder, or family member, or after something that indicated the place’s actual, physical presence in the world. Today, it’s more common to name a place after what you want it to be, rather than what’s actually there. If you buy his argument, here’s a question for you: Is it okay to continue naming physical places after feelings? Keating, our Chicago historian, says yes. But she also says there’s a downside. That lack of specificity, Callary says, suggests people care less and less about having a sense of place at all. And while placemaking once depended on external realities — geography, landscape, history — today, placemaking is a bit more amorphous. It’s a hologram of words, feelings and associations. A reality without roots. John Leahy grew up in Elk Grove Village (which does actually have an elk population,but one imported in the 1920s). But, he says, whenever he’d drive with his family through Chicago’s northwest suburbs, it was always an excursion of height jokes. But the joking led to a genuine curiosity about why the names didn’t match up with the actual geography. And he suspected it wasn’t just a coincidence. Logan Jaffe is the engagement reporter at ProPublica Illinois. Follow her on Twitter @loganjaffe.